The Skylark (Alauda arvensis) is a small passerine bird species. This lark breeds across most of Europe and Asia and in the mountains of north Africa. 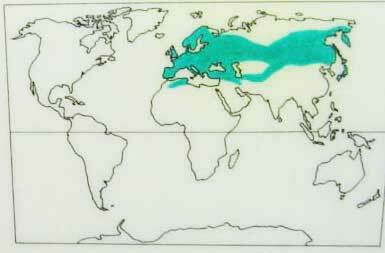 It is mainly resident in the west of its range, but eastern populations are more migratory, moving further south in winter. Even in the milder west of its range, many birds move to lowlands and the coast in winter. Asian birds appear as vagrants in Alaska; this bird has also been introduced in Hawaii, western North America, eastern Australia and New Zealand. 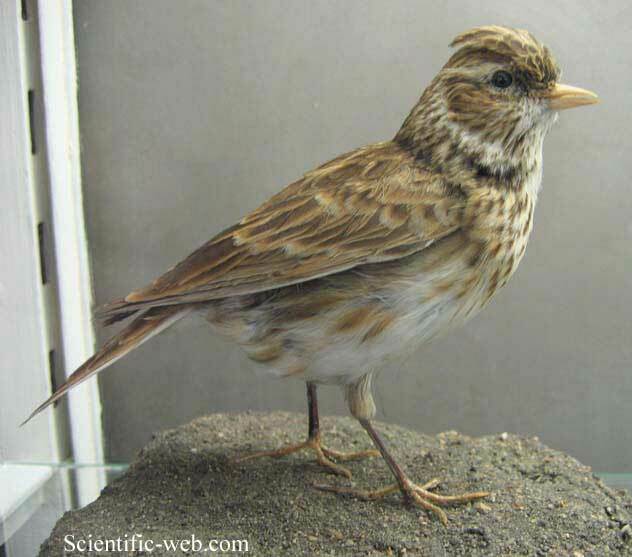 The Skylark is 16 to 18 centimetres long. It is a bird of open farmland and heath, known throughout its range for the song of the male, which is delivered in hovering flight from heights of 50 to 100 m, when the singing bird may appear as just a dot in the sky from the ground. The song generally lasts two to three minutes, but it tends to last longer later in the mating season. The male has broader wings than the female. This adaptation for more efficient hovering flight may have evolved because of female Skylarks' preference for males that sing and hover for longer periods and so demonstrate that they are likely to have good overall fitness. Like most other larks, the Skylark is a rather dull-looking species on the ground, being mainly brown above and paler below. It has a short blunt crest on the head, which can be raised and lowered. In flight it shows a short tail and short broad wings. The tail and the rear edge of the wings are edged with white, which are visible when the bird is flying away, but not if it is heading towards the observer. The Skylark has sturdy legs and spends much time on the ground foraging for seeds, supplemented with insects in the breeding season. The Skylark makes a grass nest on the ground, hidden amongst vegetation. It is sometimes found nesting in bracken, using it for cover. Generally the nests are very difficult to find. Three to six eggs are laid in June. A second or third brood may be started later in the year. The eggs are yellow/white with brownish/purple spots mainly at the large end. In the UK, Skylark numbers have declined over the last 30 years, as determined by the Common Bird Census started in the early 1960s by The British Trust for Ornithology. There are now only 10% of the numbers that were present 30 years ago. The RSPB have shown that this massive decline is mainly due to changes in farming practices and only partly due to pesticides. In the past cereals were planted in the spring, grown through the summer and harvested in the early autumn. Cereals are now planted in the autumn, grown through the winter and are harvested in the early summer. The winter grown fields are much too dense in summer for the Skylark to be able to walk and run between the wheat stems to find its food. English farmers are now encouraged and paid to maintain and create biodiversity for improving the habitat for Skylarks. Natural England's Environmental Stewardship Scheme offers 5 and 10 year grants for various beneficial options. For example there is an option where the farmer can opt to grow a spring cereal instead of a winter one, and leave the stubble untreated with pesticide over the winter. The British Trust for Ornithology likens the stubbles to 'giant bird tables' – providing spilt grain and weed seed to foraging birds. The RSPB's research, over a six year period, of winter-planted wheat fields has shown that suitable nesting areas for Skylarks can be made by turning the seeding machine off (or lifting the drill) for a 5 to 10 metres stretch as the tractor goes over the ground to briefly stop the seeds being sown. This is repeated in several areas within the same field to make about two skylark plots per hectare. Subsequent spraying and fertilising can be continuous over the entire field. DEFRA suggests that Skylark plots should not be nearer than 24 m to the perimeter of the field, should not be near to telegraph poles, and should not be enclosed by trees. When the crop grows, the Skylark plots (areas without crop seeds) become areas of low vegetation where Skylarks can easily hunt insects, and can build their well camouflaged ground nests. These areas of low vegetation are just right for Skylarks, but the wheat in the rest of the field becomes too closely packed and too tall for the bird to seek food. At the RSPB's research farm in Cambridgeshire Skylark numbers have increased threefold (from 10 pairs to 30 pairs) over six years. Fields where Skylarks were seen the year before (or near by) would be obvious good sites for Skylark plots. Farmers have reported that skylark plots are easy to make and the RSPB hope that this simple effective technique can be copied nationwide. When the word "lark" is used without specification, it usually refers to this species (OED). A collective noun for Skylarks is an "exaltation". Although the OED describes this usage as "fanciful", it traces it back to a quotation from John Lydgate dating from about 1430. The verb "skylark", originally used by sailors, means "play tricks or practical jokes; indulge in horseplay, frolic". The verb and noun "lark", with similar meaning, may be related to "skylark" or to the dialect word "laik" (New Shorter OED). Percy Bysshe Shelley's To a Skylark was written in late June 1820. A very popular jazz tune named "Skylark" was written by Johnny Mercer and Hoagy Carmichael in 1941. 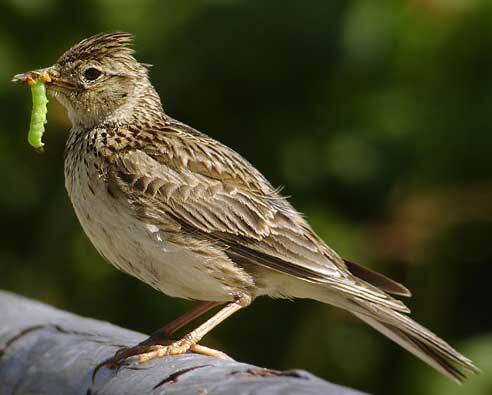 The French name for the skylark, l'alouette, became significant, mainly through song, in the culture of the French-speaking Canadians, Québec in particular, even though A. arvensis is not native to North America. See also the disambiguation entry Alouette for a complete range of examples. The Skylark is also the bird referred-to in the 1914 piece for violin and orchestra "The Lark Ascending", by composer Ralph Vaughan Williams, the piece being inspired by an earlier poem by George Meredith. 1. ^ BirdLife International (2008). Alauda arvensis. In: IUCN 2008. IUCN Red List of Threatened Species. Downloaded on 24 February 2009.